During the Jim Crow era in the United States, African American boxers were commonly labeled "cowards." If white fighters and media claimed that black fighters lacked heart, it helped to justify why black boxers weren't allowed to compete with white champions. "Myths abounded about black inferiority," wrote Brando Simeo Starkey and Justin Tinsley about the sport during this time period. "Bigots labeled black fighters weak-stomached cowards, vulnerable to body shots." Of course, the "yellow" label was not a new one that some bigots attached to African American men in general, not just fighters-it had its roots in the days of slavery in America, when slave owners decided that the black male slaves must be cowards since they "allowed" their wives, daughters, etc., to be subjected to horrors and abuse at the hands of they, the slave owners. "Approximately 26,000 fans (including two women) watched Johnson-nearly six feet, two inches and 195 pounds-batter the heavyweight champion, who was six inches shorter and 15 pounds lighter. But it was not size that led to the pounding Burns took, it was Johnson's superior training and his desire to disprove the coward label that some white fighters had been pinning on blacks. Johnson knocked Burns down in the first round with a right uppercut, and by the eighth round Burns's eyes were swollen shut and he was bleeding from the mouth. When he was young and in his prime, Muhammad Ali "shook up the world," as he said after he shockingly knocked out Sonny Liston in the first round in their 1964 rematch. But the world shaking wasn't just a result of what he accomplished in the ring. 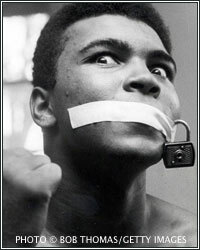 A strong, proud, African American man, Ali sorely offended many white Americans who called Ali "arrogant" and, of course most notably, a "coward" when he refused to fight in the war in Vietnam-despite the fact that, by refusing to fight in a war that he said wasn't his-and standing by his convictions--he was ostracized, faced a potential prison sentence, and had all of his achievements in his career pulled out from under him. In modern times, it may appear to some that racism in the sport is no longer an issue. Obviously the playing field is much more even in boxing these days than it was in Jack Johnson's era (unless you're a female fighter-a discussion for another time). But in today's boxing world, the prejudices are sometimes revealed in less flagrant forms-usually labels that are generally reserved for black fighters. Particularly black American fighters who fight in a classic "hit and don't get hit" style, similar to the black code fighters of the past. Over the past year or two, it has been consistently said about welterweight world champion Keith Thurman that he "can't take a body shot," particularly prior to his fight with Danny Garcia. This was supposedly borne from Thurman having been hurt to the body by both Luis Collazo and Shawn Porter in their respective fights. Yet Thurman didn't go down in either bout. He has been down before as a pro, so if the body shots from Collazo and Porter didn't drop him, why did this claim that Thurman "couldn't take it to the body" become a standard narrative when Keith Thurman is being discussed? Reminiscent of the Jim Crow era color line when blacks weren't allowed to fight whites, some fans and pundits appeared to draw one of their own in modern times. A couple of years ago, when Gennady Golovkin, the middleweight champion, lamented not being able to get a good fight, Andre Ward stepped up. At the time, Ward was the super middleweight king, and Golovkin and his team had been vocal about fighting anyone from 154-168 pounds. But some fans and media disparaged Ward and made excuses as to why the fight shouldn't take place. Ward, they claimed, wasn't a big enough draw. He didn't have enough of a fanbase, they said, and didn't pull in enough money. A common sentiment was that Golovkin was too small, and Ward should instead move up and fight the bigger Sergey Kovalev. Yet when Ward won the November bout with Kovalev, naysayers made the claim that the "biased" judges had scored the fight in favor of "American hero" Andre Ward. The same Andre Ward who, previously, they'd claimed didn't have a following and didn't have a name in the industry. By this point, any semi-aware boxing fan is well aware of Sergey Kovalev's repeated infractions of a racist nature over the past few years. Most recently, in April, Kovalev tweeted a video referring to Ward that contained racist and anti-gay slurs. At this time, neither he or his promoter Main Events have issued any sort of apology, possibly due to the fact that there was no outcry from mainstream boxing media. In early May 2017, in the lead-up to the Ward vs. Kovalev rematch, former light heavyweight champion Sergey Kovalev and his promoter, Main Events, took to social media to make dubious claims that unified light heavyweight champion Andre Ward had bailed on the filming of "Face Off with Max Kellerman." In actuality, Kovalev had failed to show up the evening before for a broadcast interview that had been scheduled, which wasn't mentioned by Team Kovalev. This led Ward to believe Kovalev would likely no-show again the next day, so he chose to leave Vegas rather than be stood up again. During the social media blasts, both Kovalev and his promoter repeatedly called Andre Ward a "coward," and claimed that he'd left Las Vegas early "to avoid" Kovalev. This logic doesn't make sense, considering Ward moved up in weight of his own accord to face Kovalev-the theoretic "big bad" of the light heavyweight division, according to HBO. Not only did he move up to face Kovalev, Ward beat him. Three professional judges--in one of the most boxing fluent commission jurisdictions in the world, Las Vegas-had identical scorecards in Ward's favor. So choosing to fight Kovalev and then beating him over the course of 12 rounds, then signing up to fight him a second time in a rematch, begs the question for Team Kovalev: how can you possibly claim Andre Ward is afraid of Sergey Kovalev? What is perhaps most telling about the behaviors of Sergey Kovalev as well as fans and media members who are partake in the actions described throughout this piece is the fact that they don't understand beforehand that what they're about to say, or post, is offensive. Kovalev seems to express confusion after his multiple social media posts that have contained racist or otherwise offensive material. He doesn't seem to know ahead of time that something is offensive, like many people who hold biased beliefs about other people. While his team has tried to write this off as a cultural issue-that Sergey hasn't lived in America long enough to understand its race issues-the reality is that he has lived and worked in America for many years at this point (his first eleven fights took place in the USA beginning in 2009). Some of his outbursts--for example his social media post from 2015 where he's pointing to a child in a t-shirt portraying a monkey wearing boxing gloves and Kovalev comments, "Adonis looks great!" (referring to WBC light heavyweight champion Adonis Stevenson)-really have nothing to do with cultural differences. They're purely a matter of human decency. In modern times, the term "coward" has become a politically safe term that many throw around, particularly in boxing and other combat sports because most people think it's applicable and it can be excused as "fight talk." But it's often and most commonly used specific to black fighters. Again, take Adonis Stevenson, who committed the cardinal sin to many vocal members of the boxing media and viewers by choosing money over machismo when he left HBO in favor of a more lucrative deal with manager Al Haymon. This meant the fight between then-champion Sergey Kovalev and Stevenson would be more difficult (but not impossible) to make due to boxing politics and the invisible line drawn between HBO and Haymon. HBO commentators wasted no time in labeling Stevenson a coward, in not so many words, on Jim Lampley's show "The Fight Game" as well as on boxing broadcasts when discussing the fighter. They loudly proclaimed that the reason Stevenson picked up and left was to "duck" Kovalev, when in reality, HBO and Main Events were not willing to pony up much cash for what they called the "biggest fight to be made" between Kovalev and Stevenson. Many in the sport seek to vilify certain fighters for wanting to make the most money they can in the most dangerous and heartless sport in the world. Kovalev, some in the media, and some viewers took to calling Stevenson "Adonis Chickenson." But have you ever noticed this type of ire and name-calling is only reserved for specific boxers? For instance, last year when Canelo Alvarez offered Gennady Golovkin a reported $10 million flat purse for a fight, the same media members and viewers expressed support for Golovkin in his refusal of the offer. How could Canelo "offer pennies" to Golovkin, who at that point had not earned over $5 million, by refusing him a pay-per-view upside? Imagine, for a moment, that the flat $10 million offer was from Kovalev to Stevenson. Or we can be generous and cut that amount in half to $5 million, guaranteed, no pay-per-view upside. If Kovalev's team had made this offer to Stevenson for the fight, and Stevenson turned it down claiming it was too little money, would the same fans and media have cut Stevenson slack? Would they have said it's understandable, that it wasn't enough money? In addition to the "coward" label, other consistent names are thrown around specific to black fighters. One of the other favorites these days is "entitled" or "self-righteous." You often see this directed at Andre Ward, particularly since the first Kovalev fight, but it's always been one of the most bandied-about terms for any black fighter who dares to behave like a human being with pride or self-confidence. some of the knock on me is because I'm not what the collective media wants me to be. The week of the [previous] fight, my team brought to me two different headlines. 'How Kovalev became a star in the sport.' No disrespect to Kovalev, but when Kovalev came to Las Vegas before, he didn't do great with tickets. And the next article was, 'Ward great talent, but nobody knows him.' The casual fan reads the headline like that and says, 'Oh, this guy is not worth watching.' When you have a lot of that, that has something to do with it." Mannix goes on to dismiss Ward's statements as "complete nonsense," and that "Ward's biggest problem is Ward." In an article from July 2016, Rafael Garcia of The Fight City denigrates Andre Ward regarding a tweet Ward posted, later deleted, which stated, "You have no idea how many opponents we had to go through to get here," presumably regarding his bout with Alexander Brand when it was finalized. The writer of the article essentially makes fun of Ward for, again, acting "entitled" and having an inflated sense of self. But, for a moment, imagine this harmless tweet had been posted by someone like Vasyl Lomachenko or Gennady Golovkin, both of whom regularly state that they're avoided in their respective divisions. Would they likely receive the same treatment? As Paul Magno pointed out in his excellent recent article, many of these critics of Ward and others like him who have fought to take control of their own careers fully expect these fighters to just shut up and fight. Sadly, the barbaric and classist world of the ancient Roman gladiators, who fought brutally and to the death for nothing more than "glory" and the entertainment of the bloodthirsty upper class, still exists in the minds of some. Much of the name-calling has become a knee-jerk reaction by many in the industry and doesn't necessarily indicate that an individual is racist. But it's a trend that has a strong history of racism and classism, and when one steps back and examines the specific fighters on the receiving end of most of the most hateful labels, there is an undeniable bias. These types of biases towards specific boxers doesn't just stop at the hateful name-calling. It has also resulted in a disturbing trend where some American fans-and American networks-are rooting for a white foreign fighter over an American fighter, particularly when said American fighter is black. We saw it very clearly when, after the first Kovalev vs. Ward fight, some HBO viewers in America expressed an odd amount of outrage over what they claimed was a bad decision in Ward winning the decision. Conversely, viewers in other countries who had seen a different broadcast team commentating on the fight had no such reaction. Even those few who thought Kovalev had won weren't outraged that Ward had been victorious-they acknowledged it was a close fight that could have gone either way. Similarly, in March Gennady Golovkin of Kazakhstan faced African American Daniel Jacobs at Madison Square Garden in New York. A large contingent of fans at the venue were rooting for the Kazakh to beat the New York native Jacobs. "White spectators consistently rooted for Louis's overmatched white opponents before and after he won the title. On the night Louis lost his first match to Max Schmeling, after many months of seeming acceptance and praise by the media and public, America's response was to hail a white foreigner's triumph over a black American. Schmeling's treatment as a conquering white hero early on laid bare the tenuous nature of Louis's claim on the affections of white America." And it seems, on the whole, black fighters still have a tenuous claim on much of America's affections.